The objective of our business is to provide high-quality products and reliable service for our customers. We hope you will enjoy visiting our web site and using our products as much as we enjoyed providing them for you. Established in 1978, we began the company as a distributor of electrical supplies for residential, commercial, and light industrial customers. In 1986 we moved from our original 4,000 sq.ft. location at 510 East Court Street to a 7,000 sq.ft. building located at 725 Big Nance Street downtown between Joe Wheeler Electric and Moulton City Hall. In 1998, we purchased the assets of Hurst & Woods Plumbing Company and added a full line of plumbing supplies. 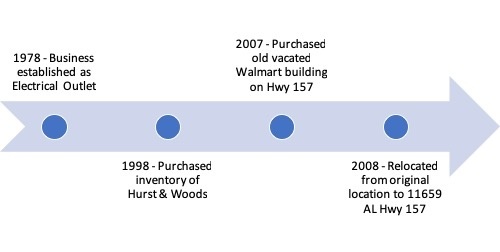 As we began to grow, we purchased the old Wal-Mart building at the intersection of AL Highway 157 and Court Street in 2007. We leased half the building to Tractor Supply Company for a new store in Moulton. In February 2008 we relocated our business to the other half. We are now in a 19,000 sq.ft. self-owned facility. In an effort to continue serving our customers, we have steadily added products throughout the years and now carry a full line of Valspar paints, hardware supplies, and Stihl outdoor power equipment. We want to be a one-stop supplier for all our customers. We have served Moulton and the Lawrence County area for 40 years and look forward to many more.